I was delighted when Mark Bolt of BoltRC rang me up recently and offered to send me a TechPod to review. I'd been looking at the TechPod as a possible search aircraft for long distance search and rescue tasks, which is an interest of mine, so I jumped at the chance to give it a try! After spending quite some time building the TechPod I finally took it for a first flight yesterday. With a small bit of tuning it flew very nicely, but it does have some quirks that are worth noting that affect tuning it for auto flight with an APM, so I thought I'd write up a tuning guide as part of this review in the hope that it will help other TechPod owners. First a bit of information about the build. I'm not a really experienced builder and I had heard the TechPod is a challenging build, so I was expecting some difficulties. I've only built about 10 ARF planes since getting into the hobby and the TechPod is certainly the most difficult build I've done. Luckily there are some good online resources to help with the build. Wayne's build videos are great, although very long and as such not ideal to use as a reference when you hit a tricky part of the build. I found Mark's build log the most useful guide. All up I spent well over 20 hours on the build (including APM install), although I suspect if I built another one then that would probably come down to under 5 hours. It isn't a build that can be rushed too much as there are a number of steps where you need to wait for epoxy to fully dry. I used 15 minute epoxy instead of JB-Weld, as JB-Weld wasn't available locally in Canberra. The epoxy worked well. I used UHU Por for foam gluing (eg. wings), which worked nicely. I only glued one half of the main pod onto the frame, and held the other half on with tightly applied 20mm fiber tape on all seams. That will allow me to more easily open up the fuselage if I want to make more internal changes (eg. changing the motor). I didn't use the glass fiber when gluing the motor mount to the frame, and just used epoxy. It is plenty strong enough with the small G10 motor I'm using. I used a tape hinge at the front to hold the pod hatch on, and fabric pins at the back. That reduced the metal near the compass, and is faster and easier to open the pod up. It is a tight fit, so I'm very confident it will hold well. I'm not planning on flying this plane inverted! With a 4S 5Ah LiPo installed the total weight came to 2.0 Kg. The ESC is installed on the opposite wall of the pod from the APM, leaving the mid section with enough room to put a hand in to get at the cables right at the back, also held on with velcro. The GPS/Compass combo is installed with clear view of the sky on top, on a little flat area I cut out with a hobby knife then held together with fiber tape. For the airspeed sensor I originally thought I'd put it on a wing, but it looked like the cable tangle when putting on the wings at the field was already going to be quite bad, so I decided to instead keep it in the pod, protruding out the front of the camera dome. I used a screwdriver to bore a small hole in the foam to hold the pitot tube, which you can see in the lower right corner of the photo. 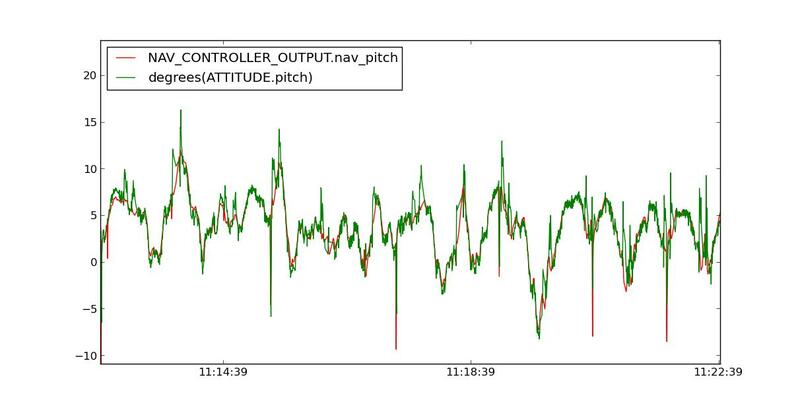 The flight logs showed that this position works very well, with not much positional error in the airspeed reading. I mounted the telemetry radio on the right wall of the pod, next to the battery, with the antenna poking out the bottom of the pod by a few millimeters, but not far enough that it will scrape on the ground on landing. Having the antenna pointing down is always a bonus, as the ground control station is usually below the aircraft. The battery was a bit of a trouble to install at first. I like my batteries to be very secure, and I found that the single surface available for velcro on the bottom of the battery didn't hold it well enough, especially with the gap in the foam floor for the downward facing camera port. I ended up using a rubber band plus wire hook harness as extra security in addition to the velcro, with the rubber band going right through the pod base on either side of the battery. For the flaps, I set them up with about 35 degree full deflection and controlled by a transmitter knob (using two channels, as the flap layout is unfortunately setup on the wing without the right reversal). I often setup flaps with manual control like this so I can easily see the impact of the flaps while flying. They can be moved to auto-flaps later once you know how they behave. I setup the CoG at the recommended position below the wing spar, although I later found that may not be ideal. I decided to takeoff for the first test flight in FBWA mode, then to switch to manual to trim the plane. For that I needed some basic conservative roll and pitch stabilisation gains. I wasn't expecting these to fly the plane well, I just wanted it to get in the air for an initial tuning session. So I could try a loiter I also set the airspeed range, which is critical for good flight under airspeed control. Most of the rest I left at default, apart from things like the battery/voltage/current setup and of course the orientation of the APM and compass (I needed AHRS_ORIENTATION=16 and COMPASS_ORIENT=16). 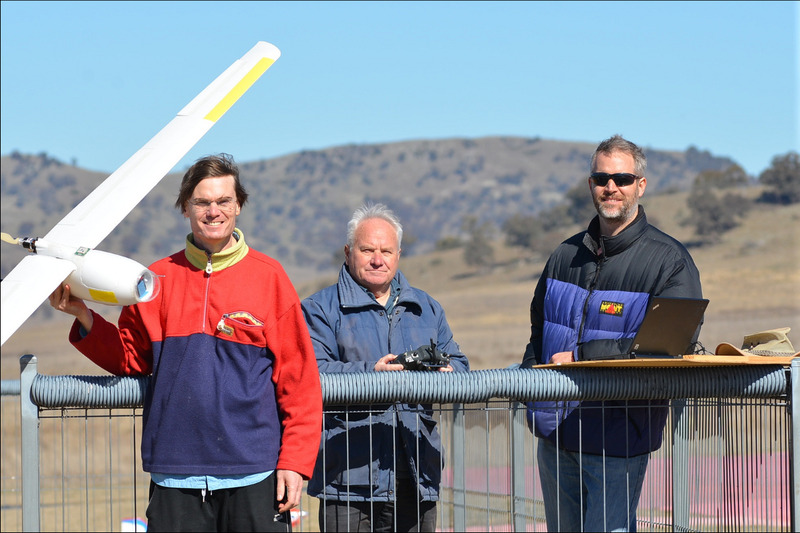 I met with three friends from the CanberraUAV team at the CMAC field for the initial test flights. Darrell also owns a TechPod (not built yet), so he was interested in seeing how it flew, plus he offered to get some photos. Chris and Jack offered to help as safety pilots while I did the tuning, which really makes life a lot easier when setting up a new plane with APM. Having two safety pilots is nice when flying a plane that can stay in the air for as long as the TechPod can, as it can get quite tiring standing there for an hour keeping an eye on a plane against the clouds! The first flight was not a great success, lasting less than 30 seconds, although luckily there was no damage! The throw was fine, but the plane refused to climb even with full elevator. It was quite stable, but stubbornly refused to go above about 2m even with some throttle adjustment, so I just let it glide in to land in the grass. It snagged a wing when it touched down, which resulted in a couple of nicks on the wing, but nothing to worry about. We then had a chat to try to work out why it wouldn't climb. We think the problem is probably that the horizontal stabilizer is generating a bit too much lift - the exact angle of a horizontal stabilizer is a bit tricky to get right when building a foam plane, and I think mine is presenting too high an angle of attack, causing it to lift up the tail. I had noticed in Wayne's flight logs that his pitch tuning was pretty bad, with a lot of up elevator applied even when in level flight and the plane not achieving the demanded pitch, so I suspect this problem isn't unique to my plane. That worked very nicely, and the TechPod took off very easily on it's second flight, climbing steadily to 100m with graceful turns over the field. It is a very low stress way of trimming a new plane. One thing that became very clear quite quickly was that the motor/battery/prop combination I'd chosen was way overpowered for this plane. I'd installed a Turnigy G10 810kV motor with a 4S battery and a 12x6 APC prop. That combination is mentioned by several people as recommended for a TechPod, but it really is far too much, at least with the 2.0Kg flying weight that I had. According to eCalc that gives around 500W of mechanical power, and I think a combination that aims for about 200W or perhaps even less would be a better choice. Most of the second flight I was using less than 75W of electrical power, and given that electric motors are very inefficient when operating well below their peak power I was probably only getting around 37W of mechanical power (eCalc thinks efficiency would be below 50% for this setup at the current I measured). Luckily being overpowered didn't worry the APM, as the TECS controller just adjusts the throttle down accordingly, so it still flew fine, but it would fly for a lot longer with a better motor setup. Once it was in the air the next job is to tune the roll and pitch loops. It was actually flying OK with my pre-flight guesses, but I knew that how well a plane seems to be flying is often quite deceptive, and you won't get good performance in AUTO and LOITER unless you get the roll and pitch loops properly tuned. The way to do that is to graph the demanded versus actual pitch and roll. 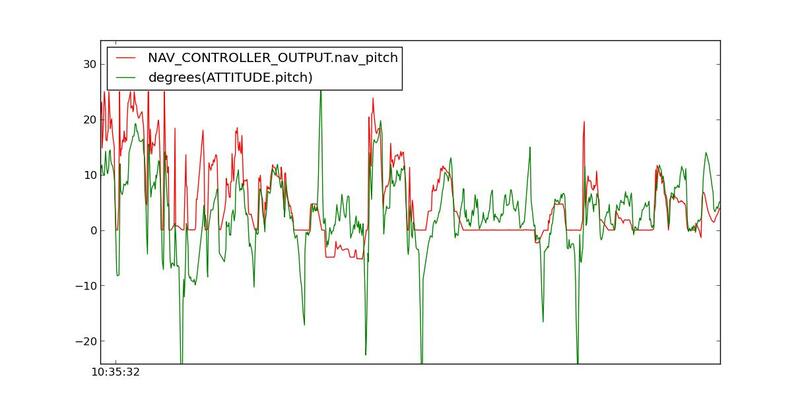 I popped up graphs on the GCS of NAV_CONTROLLER_OUTPUT.nav_roll and ATTITUDE.roll, which is what is needed for roll tuning. It was immediately very obvious the tuning was way off. as you can see, the TechPod is not following the roll demand at all well. All the gains are far too small, which is quite common for a first flight. It is usually better to guess quite low gains when doing initial setup, as it will avoid oscillations which could make the plane unflyable (and potentially stress the airframe beyond the design limits). That is much better. It isn't tracking roll exactly when level, but that isn't uncommon in an airframe that is so wind affected. A bit more D might eliminate that, but I left things at the above and moved on to pitch. The initial pitch tuning was as bad, or worse, than the roll. now the APM is much happier. When it asks for the aircraft to change to a specified roll/pitch the TechPod quickly responds to do exactly what is asked of it. I actually did the above roll/pitch tuning in AUTO, which is a bit unusual. Normally you want to do the initial tuning in FBWA mode, so you don't have any navigation control loops to deal with. I did it in AUTO as I'd tried a brief loiter after takeoff and found it quite stable, so I thought that a full tuning while flying a small rectangular circuit in AUTO would work well, and indeed it did. I'd also like to point out that if you are reading this and thinking you'll just copy these parameters for your TechPod then please be careful! The correct tuning values are very dependent on lots of factors that tend to vary between airframes of the same type. You might have slower/faster servos than me, or use different holes in the servo horns, or have a different takeoff weight. It is better to start with some low conservative gains then tune it for your airframe than to just grab someone elses gains, otherwise you risk nasty oscillations if the gains you copy are too high for your setup. Eventually we'd like to add a "auto tuning" mode to the code so you can just change to AUTOTUNE and let it fly for a couple of minutes to tune the plane, but for now you do need to read the tuning guide and tune APM manually. 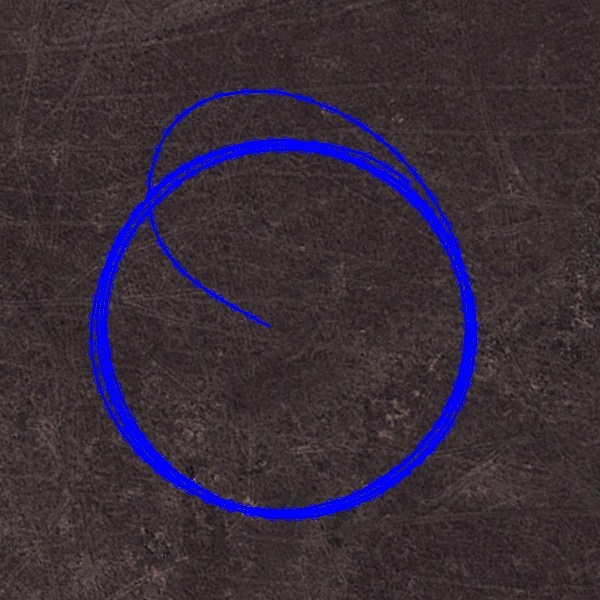 I ended up lowering NAVL1_PERIOD a bit more (to 16) later, which helped it cope with higher airspeeds and a bit more wind, but the initial value was certainly good enough. 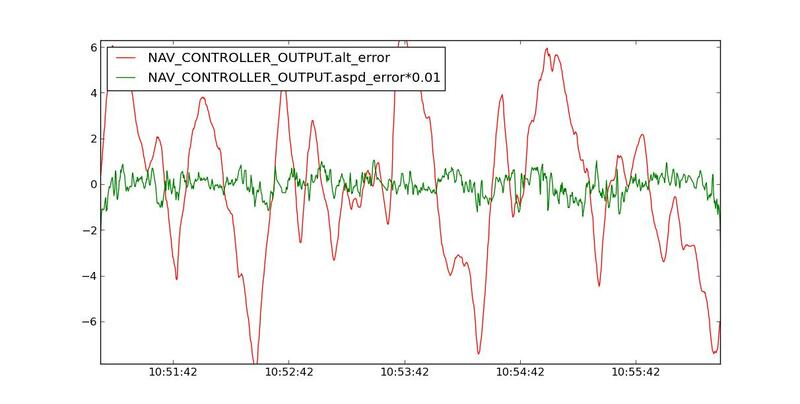 The next step is to see if TECS is behaving itself. TECS is the new Total Energy Control System which is the speed/height controller in APM. It is very common that the TECS defaults work well, and indeed I found they worked nicely for the TechPod too. As the TECS tuning guide suggests the main thing to tune is the turn handling, to ensure the aircraft didn't gain or lose too much altitude in turns. 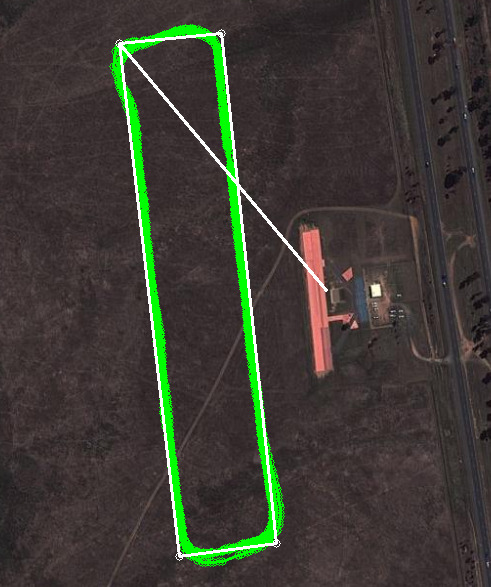 I found this was fine already, with a typical altitude change in turns of around 2m or so, which is hardly noticeable when flying at 100m. The airspeed control is quite good, varying by about 1m/s either side of the target, but the altitude is varying by up to 8m. The strange thing was that this altitude change didn't correspond well to turns. Paul and I looked at this together later and we think what is happening is the TechPod was getting quite strongly affected by updrafts and downdrafts. The logs show quite a few occasions where it had the motor off, and was climbing without losing airspeed. The energy has to be coming from somewhere, and the only likely explanation is a thermal. It really is a glider. We could try to compensate for this in the tuning if exact altitude hold is critical, but as my aim was for long distance flight I wasn't worried about a few meters of altitude deviation, so I didn't spend any time on it during the flight and just moved on to looking at battery usage at different airspeeds. My interest in the TechPod is for search and rescue, where the key is maximizing range, not endurance. That usually means a bit higher airspeed than the speed you would want for maximum endurance. 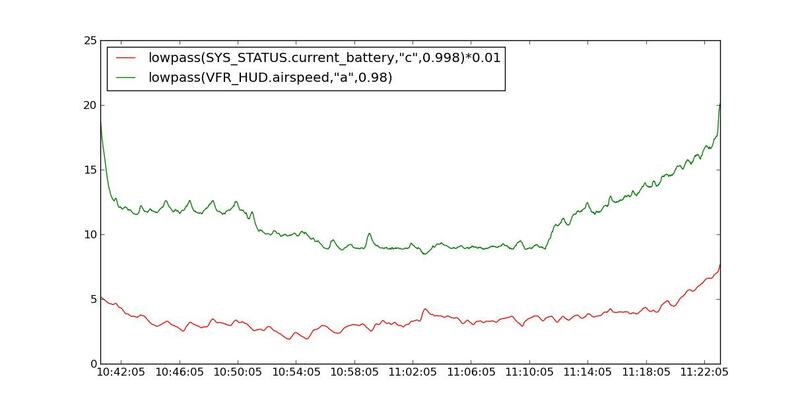 The thing that surprised me is how close to linear the relationship between airspeed and current was over this range. I expected the current to rise a lot faster than the airspeed. It either means we are on the flat part of the power/airspeed curve, or perhaps we are seeing the impact of increased motor efficiency at higher current, combined with the lower drag profile at higher speeds. As far as how the plane was in the air, it looked very comfortable at 11m/s and above. Below that it wafted about a bit, but above 11m/s it looked nice in the air. Above 18m/s it started to get too twitchy, so I think the comfort zone is 11 to 18m/s (that is 22 to 36 knots). After this tuning flight (which lasted a bit over 50 minutes) we flew the TechPod again, but this time letting it sit at 10m/s the whole time and just let it fly in a circuit to see what endurance it could achieve. In total it flew for 71 minutes, with about 20% battery spare at the end (according to my LiPo charger). That is certainly good, but nothing like the 170 minutes that Wayne recorded. The main difference is I had a much smaller battery. I used a 5Ah 4S whereas Wayne had a 10Ah 6S, which means 3 times as much battery capacity. I suspect Waynes motor was probably running much closer to its optimal operating power too - as I mentioned previously mine was running at about 50% efficiency, whereas 80% should be achievable (at least according to eCalc). I'll do some more experiments soon with some alternative motor setups to see if I can get a bit more range from the TechPod. I wouldn't be surprised if someone (perhaps Wayne?) posts a 4 hour log soon. It was really fun trying out the TechPod, and I'd like to thank Mark from BoltRC for sending it to me! It is the most affordable long endurance plane that can carry enough camera payload to be useful that I know of, and I think that as long as you don't mind flying in light winds it could indeed be useful for search and rescue tasks. There are a few ways it could be improved though. I suspect the build could be made a bit simpler. It probably won't get down to the level of building a Bixler2 (which takes around 30 minutes if you have done one before), but I think it could be brought down a lot from the level it is at now. I also think the horizontal stabilizer might be able to be improved. Paul and I suspect it is giving too much lift, which is pushing the nose down. That will be cutting the flight time a bit. Paul also suggested that the elevator should extend all the way across the stabilizer, which would give more pitch authority, and also be aerodynamically more efficient. I also think the pod could have a few more flat surfaces in it, and have a bit better layout for equipment. Overall though it is a very efficient airframe, and works very nicely with APM! Thanks for the detailed review Andrew. I note your detailed findings on endurance, do you have more detailed comments on range? With the setup I flew yesterday it was surprisingly linear, which means that 2nd flight of 71 mins with 20% battery remaining at 10m/s gives a range of around 50km, and that should be the same for a bit higher speed too. I suspect that with a better motor/prop setup so it is running more efficiently that the same capacity of battery would do 50% more range, so maybe 75km. Wayne got about 120km for his 170 minute flight with a lot more battery - I expect that with a bit more effort it will be capable of well over 200km. I'm hoping to have my 1900 SkyWalker in the air sometime, it built and ready. Thanks Tridge, hugely informative and valuable, especially the tuning part, this should really be used as a basic tuning guide for any plane. Makes me want to go fly and look at the same things you did. I'd suggest you start with a bit less weight with the SkyWalker, then raise it once you are comfortable with the plane. It is much easier to fly with less weight, and that will keep the stall speed lower. The APM doesn't yet have automatic stall recovery. You should be turning into those thermals Tridge... How does the speed controller fare being inside? I always put mine outside for cooling. +1 for AUTOTUNE! In the meantime, I'll just refer to this excellent tuning guide. One thing I forgot to mention in this posting is why I didn't need to calibrate the airspeed sensor on the TechPod. I was flying with the latest git master which includes the new ARSPD_AUTOCAL option which enables the airspeed auto calibration 3 state Kalman filter that Paul Riseborough developed. It worked very nicely! It results in much more accurate airspeed calibration than doing it manually, and also allows the APM to compensate somewhat for sensor drift in a long flight. It will be in the upcoming 2.75 release.